Super Eagles legend Austin ‘Jay Jay’ Okocha was among the FIFA legends that announced the finalists for the 2017 FIFA Best awards at an event in London. 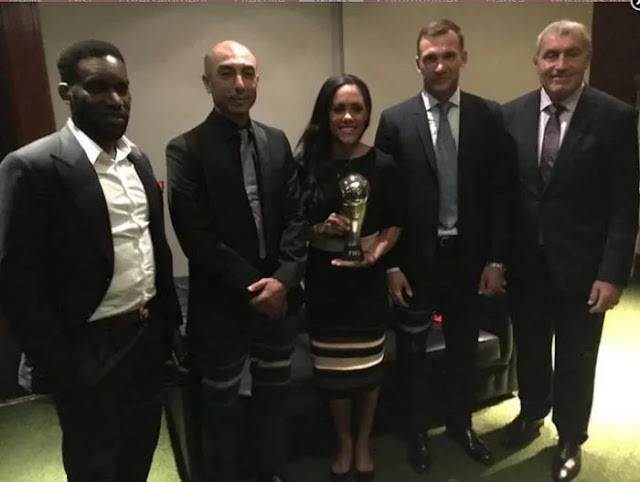 Okocha attended the event at the Bloomsbury Ballroom in London alongside former Italian midfielder Roberto Di Matteo, England’s Women international Alex Scott, Ukraine legend Andriy Shevchenko and ex-England goalkeeper Peter Shilton. The final nominees for a host of The Best FIFA Football Awards have been revealed at an event in London, with the countdown to the ceremony itself in England’s capital on 23 October now well and truly on. The Best FIFA Men’s Player 2016 Cristiano Ronaldo is once more in the final three, with long-time rival for FIFA’s top individual award Lionel Messi also in the top trio, alongside his former Barcelona team-mate Neymar. Other highlights from today’s announcement in London, with FIFA Legends Roberto Di Matteo, Jay Jay Okocha, Alex Scott, Andriy Shevchenko and Peter Shilton in attendance, saw the nominees for the inaugural The Best FIFA Goalkeeper award announced. Gianluigi Buffon, Keylor Navas and Manuel Neuer make up the first ever shortlist for the award recognising the game’s top custodians. There’s a difference in the list of The Best FIFA Men’s Coach finalists, with former Juventus player and 2016 finalist Zinedine Zidane in the final three once more, while the Italian duo of Juventus coach Massimiliano Allegri and former Gli Azzurri midfielder Antonio Conte both make their debut in the list of finalists. The FIFA Best Award ceremony will hold on Monday, October 23 at the London Palladium theatre.